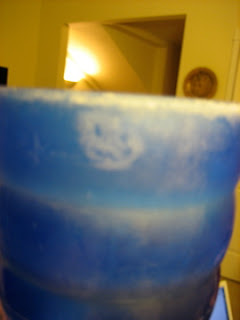 Imagine my surprise at seeing something looking back at me when I took this plastic cup out of the dishwasher today. Pareidolia is the sort of thing that has people seeing dead popes in bonfires and selling Jesus crepes on Ebay for exorbitant sums. I think that the intelligent and all-around fantastic readers of Steingruebl World Enterprises can do better than that, and should be rewarded. The smiley face of the Comedian's badge from the Watchmen comics by Alan Moore. It looks like a digestive biscuit monster from the game "Labyrinth" for the BBC micro.. takes me right back to my teens. If you shoot it, it turns into little yellow psychotic diamonds. What *were* those people on when they made that game? Looks to me like the Smiley cookies from Eat-n-Park--but maybe I've just spent too much time in western Pennsylvania.